Winners of the Innovations in Fuel Cycle Research Awards are invited to present their papers at the ANS Winter Meeting or the Fuel Cycle Technologies Annual Meeting, and to participate in an Innovators' Forum. Innovations Award winners and DOE officials attended the Innovators Forum in April 2012. Back row, left to right: Jennifer Shafer Braley, Ethan Bates, Andrew White, Brendan Kochunas, William Sames, Nicholas Thompson, Roger Kapsimalis, Nikolas Antolin, Rebecca Ward, Mike Massie, Adam Parkison, Andrew Nelson, Shadi Ghrayeb. 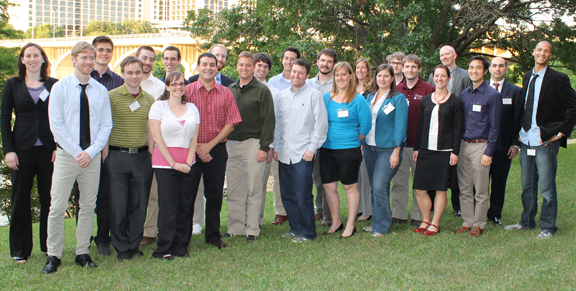 Front row, left to right: Erik Johnstone, Jeremy Roberts, Amber Wright, Stephen Budy, Rob Price, David Schnaars, Tara Smith, Jamie Warburton, Heather Chichester, Robert Petroski, Edward Mausolf. 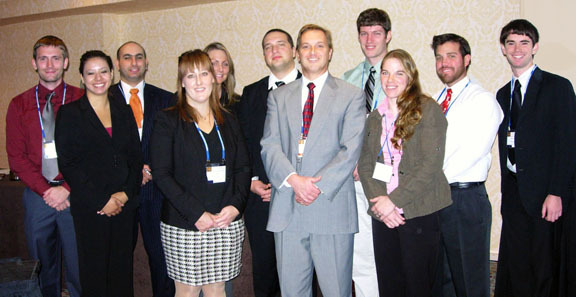 2011 Innovations Award winners and DOE officials attended the American Nuclear Society Winter Meeting in November 2011. From left to right: Adam Parkison, Ariana Alanis, Shadi Ghrayeb, Tara Smith, Lani Seaman, Greg Schmidt, Rob Price of DOE, Michael McMurtrey, Jessie Brown, Brad Williams of DOE, and Nicholas Thompson. 2011 Innovations Award winners and DOE officials attended the DOE Fuel Cycle Technologies Annual Meeting in November 2011. 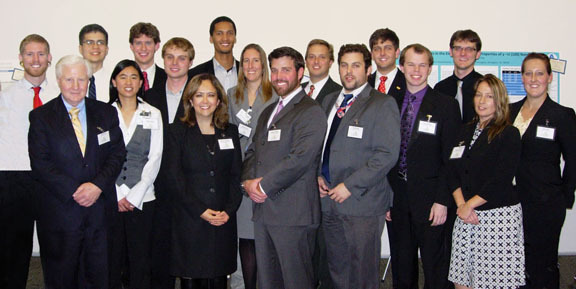 From left to right: Erik Johnstone, John Herczeg of DOE, Ethan Bates, Donna Quach, Eric Miller, Ryan McDermott, Monica Regalbuto of DOE, Edward Mausolf, Rebecca Ward, Brad Williams of DOE, Rob Price of DOE, Dan Vega of DOE, Carey Read, Sam Brinton, Derek Brigham, Dayla Morrison, and Tara Smith. 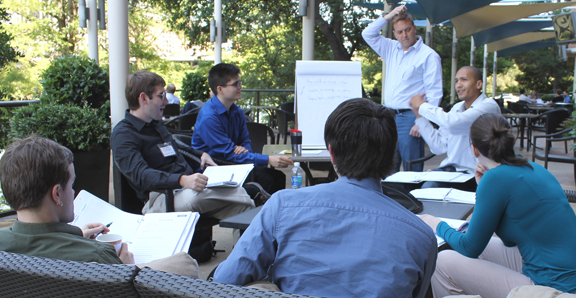 A study group discusses one of the questions posed by the 2012 Innovators Forum. 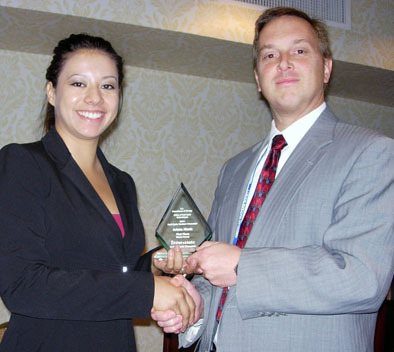 Innovations winner Ariana Alaniz is presented her award by Rob Price of the DOE Office of Systems Engineering and Integration. 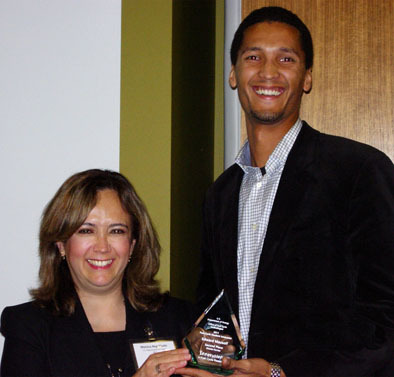 Innovations winner Edward Mausolf is presented his award by Monica Regalbuto, DOE Deputy Assistant Secretary For Fuel Cycle Technologies.